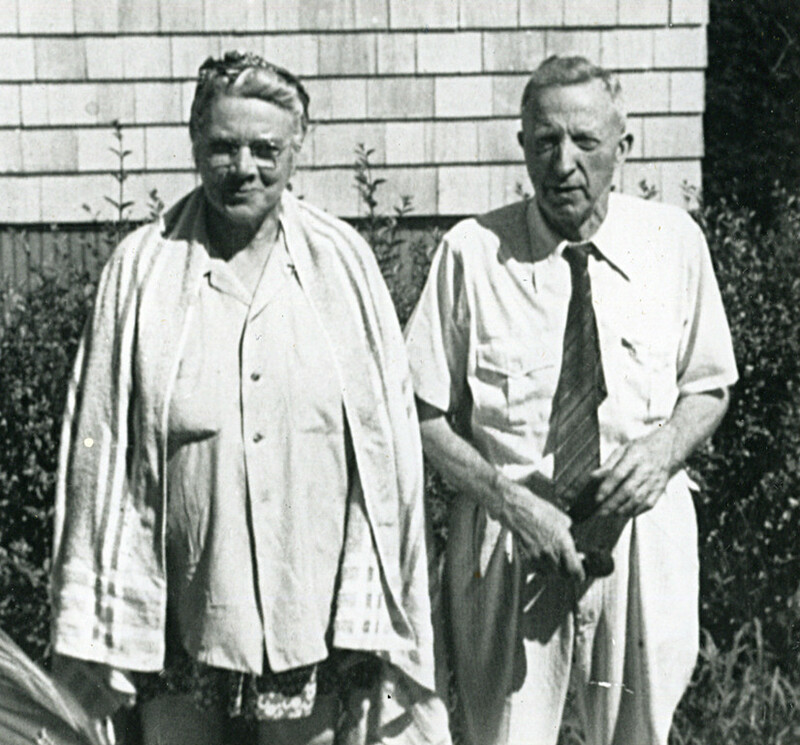 My great-grandparents, Julia and Edward Deane, ca. 1955. In my previous blog post, I wrote about my Irish great-grandparents raising their children in Holyoke, Massachusetts. Yet as I began sorting through my genealogical research in preparation for NEHGS’ upcoming Irish Family History Day on March 6, I began to think more about their decision to leave Ireland in the first place. My Nana’s parents, Julia and Edward Deane, left their home in the village of Geesala in County Mayo for America in 1909, when they were 28 and 31 years old. Julia would often recall her difficult journey across the Atlantic, plagued by terrible sea-sickness, travelling on the Titanic as she used to say. “Mama, it was the Teutonic! The Titanic sank!” my Nana used to correct her. According to the ship manifest, they arrived on Ellis Island with just $10 in their pockets and an address for Edward’s brother, Frank Deane, in Holyoke. Julia would later tell her children that once their ship had docked after the long and difficult crossing, she swore she could never endure another transatlantic crossing. The Deanes settled in a small tenement in Holyoke, where they would have eight children (five of whom survived into adulthood) and spend the remainder of their lives until their deaths in the late 1960s. Like many immigrants, Julia remained torn between a longing for her homeland and the new life she had built with her husband in America. My Nana often heard her crying when she thought of her parents and the siblings she had left behind in Ireland, especially when she received the letter reporting her father’s death. My mother recalls that when they vacationed at Misquamicut Beach in Rhode Island with her grandparents in the 1950s, Julia would look out at the ocean and point to Block Island, saying “Ireland is just across this ocean. I like to look out and pretend that that’s it there, not too far away.” Yet, while they would both often have this sadness and homesickness, they felt that they had no choice but to leave. “If you saw where I came from,” Edward used to say to his children, “you would understand.” As Julia had sensed when she set foot on Ellis Island on a June day in 1909, they would never again return to Ireland or see the family they left behind. My Nana (right) in front of her mother’s home in Ireland in 1973, with her Irish cousins. In 1973, however, less than five years after her parents died, and decades after they had emigrated, my Nana flew across the Atlantic to Ireland. She wrote to her relatives who had remained in Geesala all those years, and visited the very house that her mother had grown up in, still occupied by members of the family. 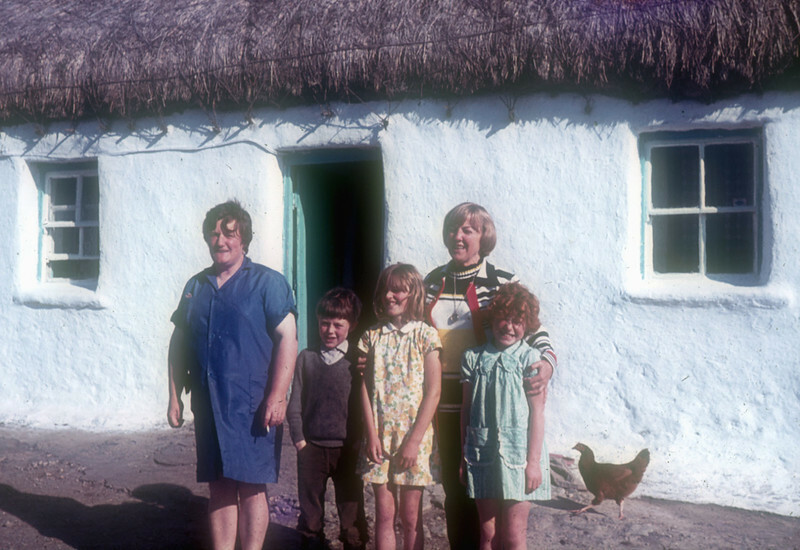 It was a small, thatched cottage with no plumbing and a dirt floor, located on a remote farm with chickens running about the yard. My Nana often said that she was struck by a sense of feeling at home in this village her parents grew up in, as well as a realization of how different her own life would have been had they stayed there. While her cousins grew up in this small cottage farming the land, she was able to attend night school in Holyoke, become a manager of a store, own her own home with her husband, and send many of her eleven children to college. As anyone with an interest in genealogy knows, this pull to an ancestor’s country of origin, and the appreciation of how immigration affected so many lives, persists in each new generation. Over a hundred years after my great-grandparents boarded the Teutonic, there is no question that my family is now thoroughly American. Yet despite the years, and the changes that have come to pass, many tales and traditions that my great-grandparents brought with them from Ireland remain in my family. An old story about a man falling in love with a mermaid is known to everyone by heart, each New Year the “man of the house” is the first to walk through the door according to custom, and almost every family gathering features an old Irish tune played on an uncle’s fiddle or a jig danced by the aunts and cousins. When I recently took my own trip to Ireland, I found that there were even more traits and subtleties that were passed through the generations: a glimpse of my father’s wit in someone’s joke or story, a reminder of my grandmother’s hospitality as a woman greeted me with a hug and an offer for tea, or a turn of the head as I saw my mother’s face on a passing stranger on the street. As I continue in my research, I hope to learn more about the lives that my great-grandparents left behind when they immigrated to the U.S., and to uncover further connections to Ireland that have been passed down through the generations. If you are interested in discovering more about your Irish heritage, I invite you to join NEHGS and the Ulster Historical Foundation for Irish Family History Day in Boston on March 6. I hope to see you there! Great story. I often wonder how my ancestors felt when they left home for America. Many of them never got to go back and see home and family again. The various branches of my family tree have been in the New World for from 140 to over 300 years, mostly from Germany. Yet, I still feel the pull of family traditions, the yearning to know the villages and countryside from which they came, and curiosity about exactly why and how they emigrated. Over the past 50 years I’ve learned a lot about those things, but still there are many mysteries still unexplained. I’ve never been to Germany, the closest I’ve ever been is the Netherlands and Switzerland (before I knew I had some roots there), but if I had the resources and the opportunity, I’d go in a flash. I always said that if I ever won a really big lottery, I’d do a lot of travel to many places for many reasons, but the first priority would be an extensive genealogy and family history tour in order to do research, explore places, and meet distant kin. What a lovely, poignant story. Thank you for sharing it. Beautiful story, Kathleen, and thank you! Like your nana (my mom! ), I felt surprisingly “at home” when I went to Ireland, too. I recently read a book entitled, Paddy’s Lament, by Thomas Gallagher and since then I’ve been curious as to what our grandparents knew of their families’ experiences during the 1840s Famine. Perhaps you’ll find out in your future research! Lovely story. We had a longstanding and bitter family feud over the cottage in Ireland. My mother went to see it in the late 1940s, 60 years later, and commented that “it wasn’t worth the fuss.” However humble it was, it meant a great deal to the people who left. What a touching story! So personal. My heritage is Scottish, Irish, English and I often wonder what it was like for my ancestors to have left all behind. This made me feel a little teary (in a good way) thanks! Well done. Have a great day on Saturday. Also, keep going back! About “going back”: A good many did, some to stay. Others for reasons simple as nostalgia on up to estate settlement. The only obvious returnee “cousin” I’ve found was the “Mr. Thomas” Gerrity who returned from “Ballyvary, Mayo”, as was clearly recorded in Ellis Island records, and then disappeared on me into the Greater Chicago plethora of many Thomas Gerritys. My parents went back once but not out into the countryside: An organized “If This IS the Blarney Stone, It Must Be Wednesday” tour in the late 1970s that they enjoyed hugely (with, yes, pictures of them laying down to kiss the stone), way before part of the country became the Celtic Tiger. They actually had enough time in Cork to with meet Dad’s Mother’s Hagerty/Hegarty cousins with whom there had been some ongoing correspondence since his elder sister’s European liner tour of 1937. (Boy, did those faces look like my Gerrity aunts! Alas, the letters have not survived.) If I’ve actually gotten back sooner in my research to Ballyvary, they might have gone again to Mayo and Cork, and things would be a whole lot clearer. As it was, one of their seasonal bus tours (Dad helped organize them so he could ride free & Mom was at half price) was to several places on Cape Cod which hired young Irish people as waiters/waitresses, etc, all working on keeping up their brogue with an eye to moving here permanently. So, they got to chat up “close to home relatives” and together reminisce about the old sod. They always told me what a good time they had meeting them and filled me on the personal details. Again, thanks. Please do a follow-up either here or in the Weekly Newsletter on what transpires on Saturday. And a Big Hello to Marie D.